I think you all know my opinion on the Nexus 7 vs. iPad mini comparison that Apple walked through today during their press event. Aside from that, here is the spec breakdown between the two. Since both are in different price ranges, it seems like a silly comparison, but hey, Apple felt it was necessary, so let’s do it. It’s tough to claim that we have a winner here, however, the Nexus 7 is no slouch, even at such a ridiculously low price. The iPad mini looks nice for something not in the budget category. *Note – Google has a 32GB Nexus 7 on the way for $249, but since it hasn’t been officially announced, we left it off for now. We also don’t know the fate of the 16GB and 8GB models. 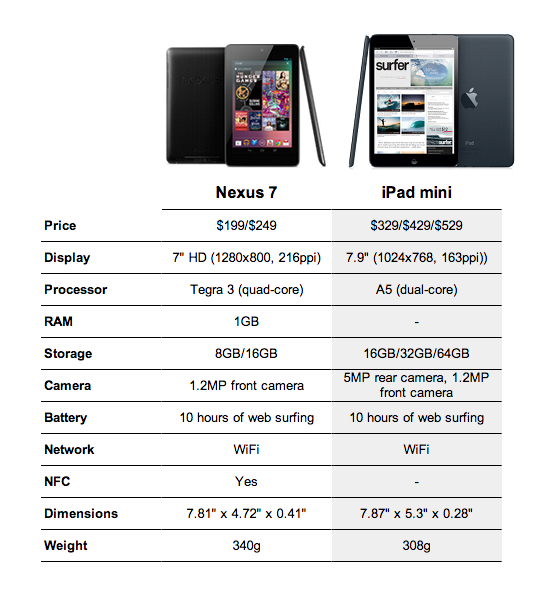 Apple's Comparison of the iPad Mini to the Nexus 7, What a Joke.